Hearts' new loan signing Abiola Dauda is confident he will be able to handle his first Edinburgh derby, after sampling the "crazy" Belgrade city rivalry. Dauda arrived at Hearts on loan from Vitesse Arnhem having had a previous spell in Serbia with Red Star Belgrade. 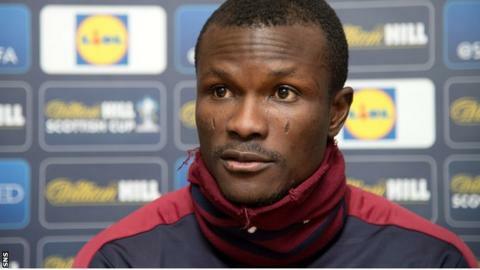 "I don't think it will be more than what I've experienced before," the Nigerian said of Sunday's Scottish Cup fifth round clash with Hibernian. "It's the same experience I had with Red Star and Partizan." Dauda says his experience of the intense rivalry between the Belgrade clubs has taught him not to get too swept up in the emotion surrounding derby matches. "The fans there, they're crazy," the striker told BBC Scotland. "The week before the game the training ground is packed full of fans trying to let us know how important it is. It was hard. "In the beginning I was thinking it would be like a do-or-die thing, but you get to understand that these games are for the fans, not for the players. Just do it for them. That was my experience there. After that everything becomes easier to play." Dauda admits he knows little of Hibs or the history of the rivalry between the Edinburgh clubs, but he is still relishing the prospect of the Cup tie at Tynecastle. "This is a game for the fans and we have to respect that," he said. "Ever since the draw was made we've been looking forward to this day so there is a lot of tension now and talk about the game but it's a derby so it's normal to be like this. "I think it will be a really great atmosphere based on what I've seen in videos so I'm looking forward to seeing how it will be."